Charlton manager Lee Bowyer watching Posh win at the Valley. Photo: Joe Dent/theposh.com. Charlton Athletic manager Lee Bowyer launched an astonishing tirade at referee James Linnington after Peterborough United pinched a 1-0 League One win at the Valley with a late penalty last night (August 21). Bowyer was incensed at the award of the spot-kick for an alleged foul on Posh substitute Ivan Toney. He didn’t hold back in his post-match press conference. 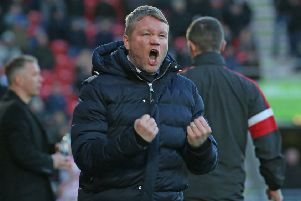 Posh manager Steve Evans celebrates victory at Charlton. Photo: Joe Dent/theposh.com. “We were the better team,” Bowyer told the South London Press. “We competed, we left everything out there and I know that we’ve been cheated. “There is no denying it. Everybody in the stadium saw it. It wasn’t a penalty. Now he (Linnington) is sitting in his little room over there thinking it’s acceptable to make that decision and then he’ll go home and he’ll sleep alright. But I know I won’t, my players won’t and most of my fans won’t. “Is it acceptable? No. Am I probably going to get into trouble? Yeah. But should he get in trouble? Yeah. He shouldn’t be reffing. He shouldn’t be able to ref the next game. He just made a decision there and said the fella got pushed. The fella tried to dive to head the ball. There was no push – they were side by side. “Is there contact? Course there is. You’ve got two players running at 100 miles an hour, one trying to defend and one trying to score. There is going to be a contact. But is it a penalty? No. Anyone who has played the game knows it’s not a penalty. That’s my thoughts. It’s an absolute disgrace how he can make that decision. “And if I’m getting in trouble, he should get in trouble. It’s as simple as that because he’s just robbed us of a point, maybe three. “We were the team on top and going to score – not them. Bowyer marched onto the pitch to confront Linnington after the game. Both managers had been booked in a spicy contest. “Trust me, you don’t want to know what I said to him,” Bowyer added. “I’ve played the game so long, since I was a kid. And then you’ve got someone making that decision at that time of the game when it’s wrong. Everyone can see it. But all night long the slight 50-50s were going to them. “Their manager is this big geezer standing on the side and bullying the fourth official – constantly hammering the fourth official – and maybe he’s (Linnington) afraid, I don’t know. Maybe he has been bullied into that because every slight decision went to them. Every single one. “We had Lyle Taylor getting across the near post and their defender marked him and there was contact and he gave us a corner. Is it similar? Yeah. Is it a penalty? No. But neither was their one. All I ask is for them to be fair. But they can’t – because they don’t understand the game. He don’t understand the game. He’s not played the game, he don’t understand the game. Evans predictably had a differnt view of the penalty.